If you’ve never heard of Bonsai before, it is basically the art of artificially growing a miniature-sized tree. They are grown in pots, but would grow into full sized trees under ordinary circumstances. It allows you to watch miniature versions of large trees right in your own house/yard, hence the beauty (and complexity) of the art. While the art of raising Bonsai trees is intimidating, most people can get by with basics. Some of the materials you would need are: hammer, drill, safety goggles, drill bit, screen filter, bonsai shears, bonsai wire, volcanic rock, potting soil, spoon/chopstick, planter and plant of choice. There are many trees with which you can begin your Bonsai journey, but you should select a tree that is appropriate to your circumstances. You should consider if you plan to keep your trees inside or outside. It is best to select an indigenous tree species. Once you are ready to purchase, you can either buy the Bonsai plant outright (at a hefty price) or you can simply purchase a prebonsai. 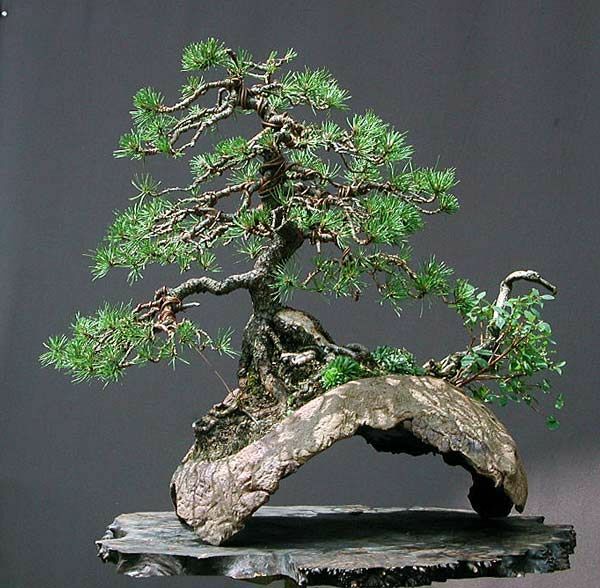 A prebonsai is the material you will need to shape the tree into a Bonsai yourself. You can also collect the prebonsai directly from nature or, simply grow the tree yourself from the seedling, which takes more time. • If two branches are of the same height, remove one while leaving the other. • Branches that appear to be twisting and turning unnaturally should be cut. • Branches that are too thick as compared to the other branches should also be pruned. Wiring is another vital technique for Bonsai cultivation. You can wrap the wire around the branches to bend and shape them. Be sure that the wire is removed to allow the tree to grow without scarring. Watering must be done properly to ensure maintenance. If you over water your Bonsai masterpiece, this could be fatal to the tree. You also need to choose the right mixture of soil and change the pot regularly so that water is not soaked up quickly. Be sure to keep the Bonsai tree free of pests and diseases. Make sure the environment is well-ventilated and lighted. Picking the right environment is important for a successful Bonsai project. Consider a property with enough space to accommodate your Bonsai hobby. Zipmatch, an online property finder in the Philippines, which lists thousands of properties across the country, will make your search for a Bonsai-friendly space easier and faster.